This drawing depicts the interior of a plant cell. The green structures are chloroplasts. This drawing depicts the interior of a chloroplast. The ladder-like structures are grana, which consist of stacks of tykaloid membranes. The membranes contain chlorophyll and other compounds necessary for trapping and storing light energy. All life on earth is dependent upon the ability of plant cells to trap and store energy from the sun. The drawing above illustrates a protein. Proteins are the basic building blocks of life. Each protein complex present in the thykaloid membrane contains many proteins. 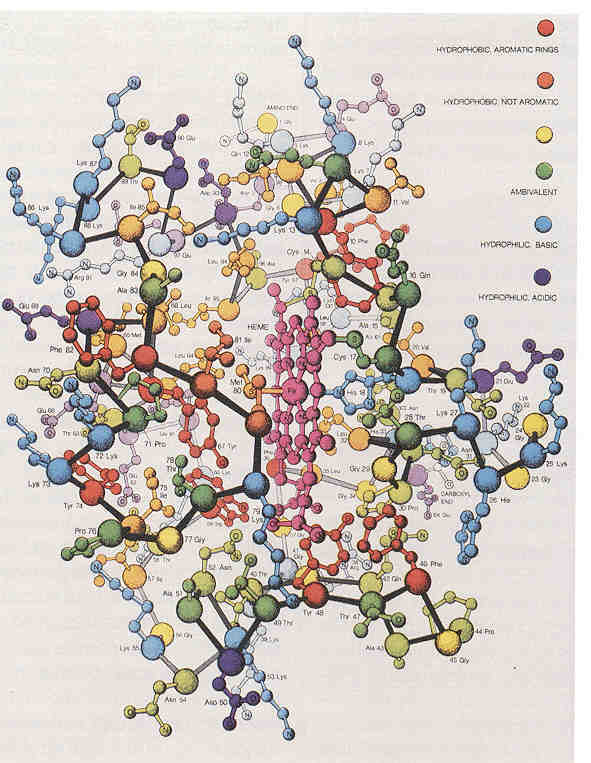 Proteins are made up of specific combinations of twenty possible amino acids. A typical protein contains around 300 amino acids. The position of every individual amino acid is very important, since the sequence determines how the protein will fold which determines how it will function. Even one substitution can greatly change the shape of a protein and destroy its ability to function as needed. The probability of even a smaller, 100-amino-acid protein forming by chance is around one in 10158. 2 That is ten with 158 zeros after it. It is estimated that there are only 1089 elementary particles (electrons, protons, and neutrons) in the known universe.3 So, even if every elementary particle in the known universe was an amino acid and even if all of them could combine at the staggering rate of 1,000 times a second for the supposed age of the universe (30 billion years), the chance of forming any particular 100 amino acid protein would be about one in 1048. 4 In other words, such a ludicrously large number of amino acids combining at such a fantastic rate would not have the ghost of a chance of forming even a single protein in 30 billion years. Yet for photosynthesis to occur and energy to be stored in even one plant cell, hundreds or thousands of very specifically designed proteins must be present. The impossibility of proteins forming by chance in our universe is the little-talked-about Achilles heel of the idea that life arose by random processes. The emperor has no clothes, folks! There is, indeed, intelligence in life and there is, indeed, an intelligent designer. This drawing illustrates two amino acids. They have the same chemical structure, but not the same shape. They are mirror images of one another, just as our right and left hands are mirror images of each other. In any random formation of amino acids there is nothing promoting the formation of right or left handed amino acids, which form in a 50/50 proportion. Yet, amazingly, virtually all amino acids in proteins in all forms of life are left-handed. Scientists do not know why this is the case. But this fact presents a staggering additional problem for anyone who would claim that life arose from random processes. Some mechanism to weed out right-handed amino acids must be added to any story speculating about how life arose by chance. Perhaps the Designer of life wished to show with one additional twist of design the utter foolishness of believing that life could have arisen by random processes.5 Whatever exists must have a sufficient cause. Random natural processes are not a sufficient cause for life. 2http://www.icr.org/article/probability-order-versus-evolution/ This probability involves the generous assumption that of the 200 amino acids that would form randomly, only the 20 found in life as we know it were involved. 4 There are a little less than 1020 seconds in 30 billion years. With 1,000 combinations a second that is 1023 combinations. Multiplying this by 1087 groups of 100 amino acids yields 10110 total combinations of 100 amino acids. So the chance of forming a specific 100 amino acid protein would be 10 158 divided by 10110 or 1048. This is a clear, well-written article, thanks for posting. It amazes me that so many evolutionists cling to Darwin’s concept of ‘the simple cell’, when it has been repeatedly proven–and as you’ve demonstrated here–that NO SUCH THING EXISTS!!! And all this evidence you’ve presented doesn’t even touch the concept of irreducible complexity. The History Channel has a whole series on alien intervention in past human history, but that never seems to register as Intelligent Design, either. Clearly the problem for evolutionists is cognitive dissonance!